Fellow Travelers . . .
Shelley Bennett. Thomas Stothard: Mechanisms of Art Patronage c. 1800, reviewed by G. E. Bentley, Jr.
Cover: William Blake, A Vision: The Inspiration of the Poet, c. 1819-20. Courtesy of the Tate Gallery, London, England. G. E. BENTLEY, JR., University of Toronto is the author of Blake Records (1969), Blake Records Supplement (1988), and Blake Books(1977), and is presently preparing a supplement to Blake Books. MARTIN BIDNEY, Professor of English and Comparative Literature at SUNY Binghamton, is the author of Blake and Goethe: Psychology, Ontology, Imagination (U of Missouri P, 1988). CHRISTOPHER HEPPNER, Associate Professor of English at McGill University, has written a variety of essays on Blake and Shelley. 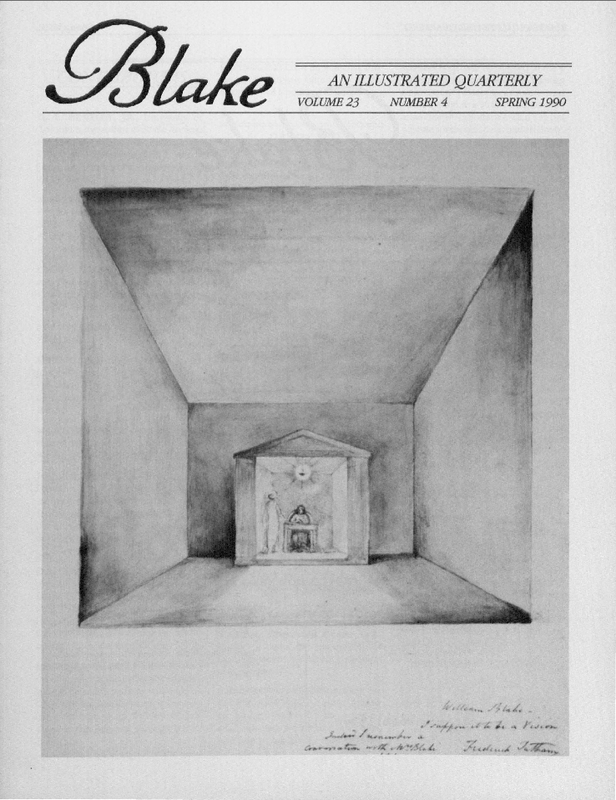 NELSON HILTON is Review Editor of Blake. HARRIET KRAMER LINKIN, Assistant Professor of English at New Mexico State University, has recently completed a book on Herbert and Blake. MORTON D. PALEY has prepared an edition of Copy E of Jerusalem for the William Blake Trust. JOHN B. PIERCE teaches English literature at the University of Toronto. He has published articles on Blake and Shelley and has recently completed a book-length study on the growth and development of Vala or The Four Zoas. SHEILA A. SPECTOR, who teaches English at Kennesaw State College, is primarily interested in Hebraic influences on Blake. Her background study, “Blake as an Eighteenth-Century Hebraist,” has just been published in David V. Erdman’s anthology Blake and His Bibles (Locust Hill Press, 1990). MICHAEL TOLLEY, Associate Professor of English at the University of Adelaide, is currently working with John E. Grant to complete the commentary for the 1980 edition of William Blake’s Designs for Edward Young’s Night Thoughts. GUNNEL TOTTIE is an Associate Professor of English linguistics at the University of Uppsala, Sweden. Manuscripts are welcome. Send two copies, typed and documented according to the forms suggested in The MLA Style Manual, to either of the editors: Morris Eaves, Dept. of English, University of Rochester, Rochester, NY 14627; Morton D. Paley, Dept. of English, University of California, Berkeley, CA 94720. Only one copy will be returned to authors. Please send disks if your manuscript was typed on a computer; note the name of the computer, the word processing system used, and the file name of your article. If possible, have your disk converted to IBM Dos 4.0, and Word-Perfect 5.0.
International Standard Serial Number: 0006-453x. Blake/An Illustrated Quarterly is indexed in the Modern Language Association’s International Bibliography, the Modern Humanities Research Association’s Annual Bibliography of English Language and Literature, The Romantic Movement: A Selective and Critical Bibliography (ed. David V. Erdman et al. ), American Humanities Index, the Arts and Humanities Citation Index, and Current Contents.